With Universal Pictures UK making their debut as an anime distributor with the Blu-ray (and DVD) release of Seraph of the End – Season 1 Part 1 we thought it would be a good idea to dive deeper into the disc content to explore what’s in store for those that wish to purchase this impressive collectors set. By now everyone should have a firm grasp on what to expect from the physical content, as seen in our recent unboxing article; but what exactly can one expect from the product in terms of subtitle qualities, menu layout and disc presentation? Well that’s exactly what we are going to explore in this article. All screenshots were taken in 720p using the HDMI bypass method on a PS3 and as such may not reflect the actual quality of the content itself. 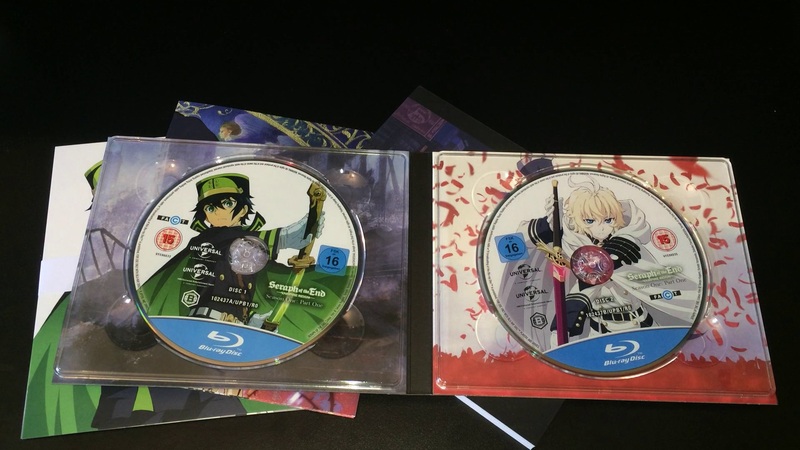 As seen in our unboxing article the discs found within this Seraph of the End – Season 1 Part 1 collectors set are littered with numerous logos; with two of the logos being from Universal themselves. Of course there is a good reason for so many logos being present on the discs; for starters one of the logos is for Universal Japan, which is of course the Japanese Licensor holder, and the other Universal Logo is for the European division of the company. The age rating logos, which are the BBFC and FSK ratings, are for the UK, Ireland, Germany and French rating boards while the remaining logos, namely the FACT and Region Logo, are for informational purposes. Finally the ‘Blu-ray Banner’ at the bottom of the disc is part of Universal’s uniform of presenting Blu-ray releases so this part of the disc is unavoidable. It’s true that the discs feature a lot more logos than the traditional anime release but these discs have been encoded for european release so it’s not surprising that that the disc artwork would look a bit cluttered. Fortunately however Universal have actually opted to place singular character artwork, the anime logo and the disc number on the front of the disc to give it a more traditional feel as previous Universal releases, such as Suits and Ted, thefeatured a simplistic artwork that was not only painful to look at but uninformative. To some the Main Menu speaks everything about what to expect from a product, such as Warner Bros release of JoJo’s Bizarre Adventure which looked like it was made in Windows Movie Maker; and while the simplistic layout is not found here it is a relatively confusing one – especially if you are unfamiliar with a Universal Pictures product. 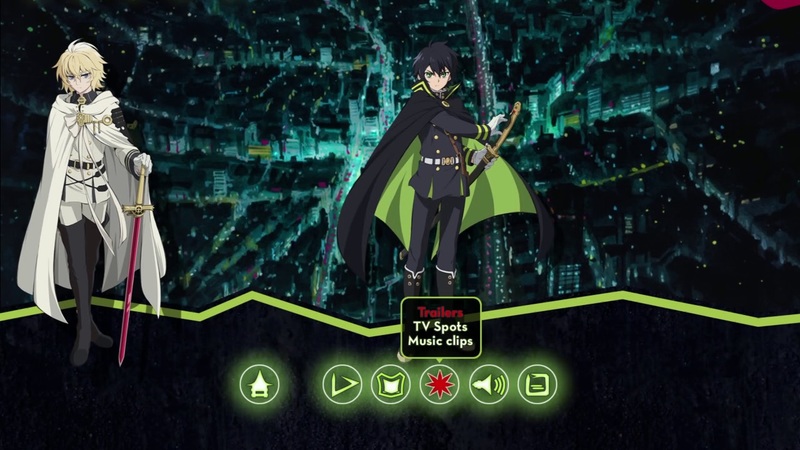 As illustrated in our unboxing video the menu for Seraph of the End features no text and instead opts for buttons; and the reason for this is because it is a standardised layout for Universal Pictures and it will not be changing anytime soon. Fortunately enough unlike most Universal Pictures products it is easy to navigate as from left to right it’s simply Home, Play, Extras, Audio and Subtitles; plus it provides some nice character artwork with elements of the show appearing in the background. The Collectors Edition of Seraph of the End – Season 1 Part 1 comes with a lot of physical content but what can one expect to receive when you put the disc into your player? Well pretty much the standard selection of bonus content you would expect to receive from any good anime release except this time they are split across the two discs. The first disc features original Japanese promotional trailers and TV spots alongside textless opening and closing songs, which are incorrectly titled as music clips. The second disc on the other hand features the 12 mini-episodes compiled together as one twenty minute feature known as Seraph of the Endless. All of the content is presented in Japanese with removable and changable subtitles and chapter-markings are included in each section so you can easily skip to the next piece of content in that selection (such as the mini-episodes). 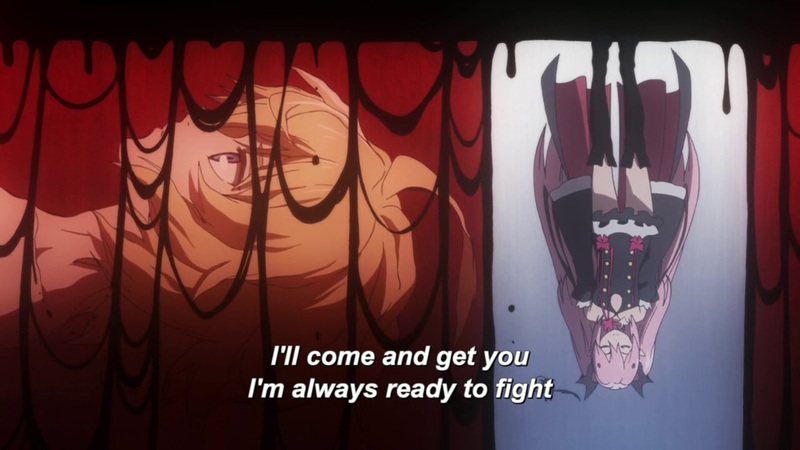 By now every episodic-related anime release should be seperated into around five different chapter markers; with the obious being ‘Intro, Opening Song, Part A, Part B, Ending and Next Episode Preview’ and I am glad to say that this release of Seraph of the End follows this pattern; so there is no chance of missing out on any content when skipping the opening or ending sequence. Potentially the most discussed topic since our unboxing was ‘what are the subtitles like?’ and I can safely say that they are different to what we may have been expecting to receive. 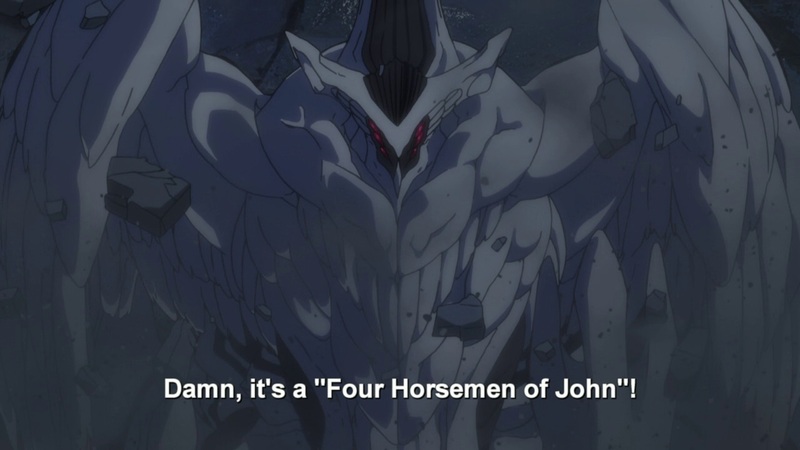 Universal Pictures are not using the same font used by FUNimation, nor are they using the same font-style used by MangaUK’s own authored Blu-rays or Sentai Filmworks yellow subtitles – it’s something completely different. Whether this is a good-thing or a bad-thing is unclear to me (I prefer the English dub); but after watching three episodes with the subtitles on I can honestly say that they are clear and easily readable on any-type of screen or background; furthermore the subtitles differ slightly from the dialogue spoken by the English version so it is safe to say that the subtitles have been translated from the Japanese dialogue rather than the English Dub; which of course is a good thing. 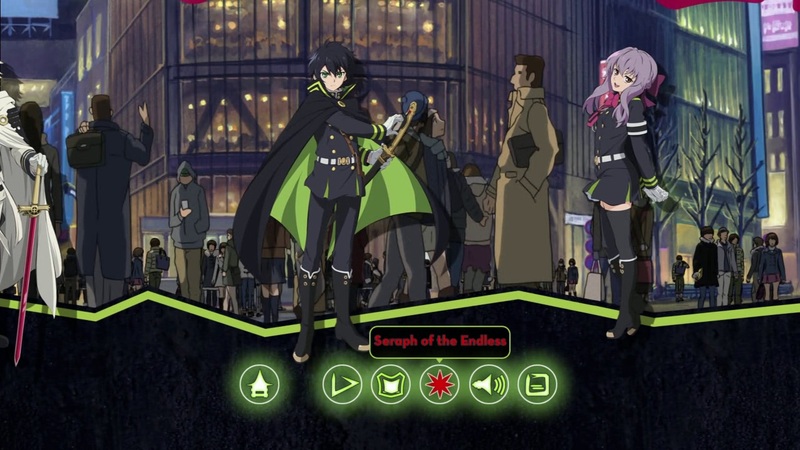 This particular release of Seraph of the End – Season 1 Part 1 features four different subtitle options, namely English, French, German and Netherlands – each of which can be accessed through the main menu or by using the subtitle button on your remote – as well as four different text/sign translation subtitle tracks which can only be accessed through the subtitle button on your remote during an episode. Another crucial question I received was “are there any text and signs subtitles” and I can safely say Yes there is; and they are not linked to any particular audio track either. When selecting English, German, French or Netherlands at the start of the disc the text-translation for that corresponding language will automatically appear. For instance if you select English, English signs and text will appear and if you select French then French signs and text will appear and so fourth. However if you change the audio setup in the main menu you would also need to change the subtitles to your preferred option; for instance if you wanted to watch the episodes in Japanese with english subtitles you would have to choose Japanese in the audio setup menu and then change the subtitle option to english. On the other hand if you wanted to watch the episode in English and have English text/signs translation turned on you would need to change the subtitles, via the subtitle button on your remote, to option five (English) rather than using the subtitle option in the main menu. The reason for this is because the subtitle options on the main menu relate to full dialogue rather than translations for text/signs. It sounds confusing but basically if you want to change the text/signs subtitle track you have to do it during the episode itself otherwise only the subtitles for the dialogue will be changed. An important thing to note is that when watching this series in Japanese with English subtitles not all of the signs will be translated unless its an important part of the dialogue. 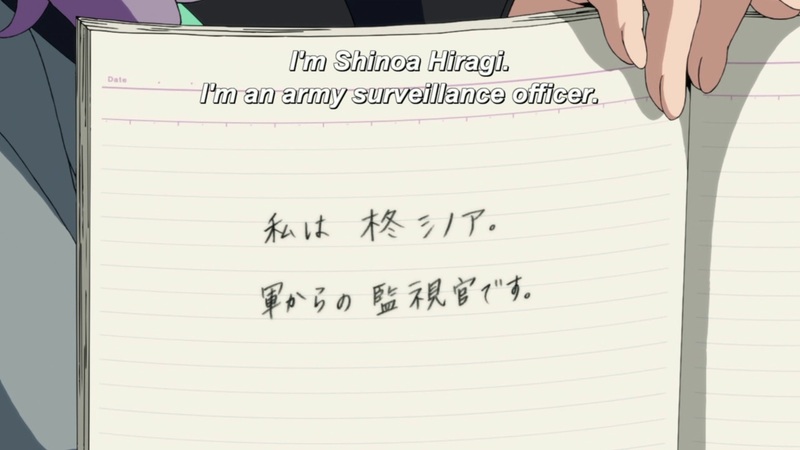 For instance the screenshot above would show the dialogue that is being spoken at the time rather than the name of the orphanage; however when Shinoa Hiragi introduces herself the text is translated (as it is an important aspect of the series). 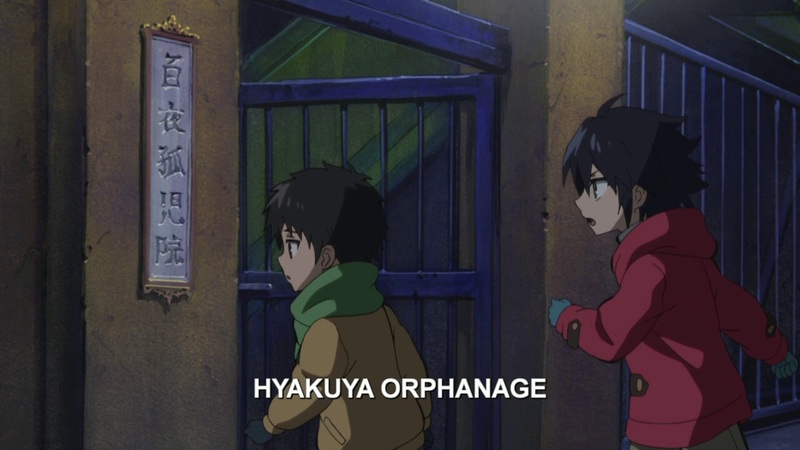 To some this may seem like a massive issue; but so far (six episodes in) it’s the only time i’ve noticed the text on screen not being translated with the full dialogue subtitles on. One common trait amongst anime releases is that they all have the opening and ending sequences translated into english for viewers to understand what’s being sung but unfortunately on this release that doesn’t seem to be the case. When watching each episode, either with full subtitles or signs/text translation subtitles turned on, non of the opening or endings songs feature any translation however when watching the textless opening and closing songs in the extras menu the translations appear. I can only assume that Universal Pictures opted to not include them during the opening and ending of each episode as they thought it would cover too much of the screen, as the subtitles would cover up the Japanese text which depicts who was involved with the shows production. Personally I do not find this an issue, as i’ve never been fond of these songs, but to people who like the song then I can understand that it would be disappointing. 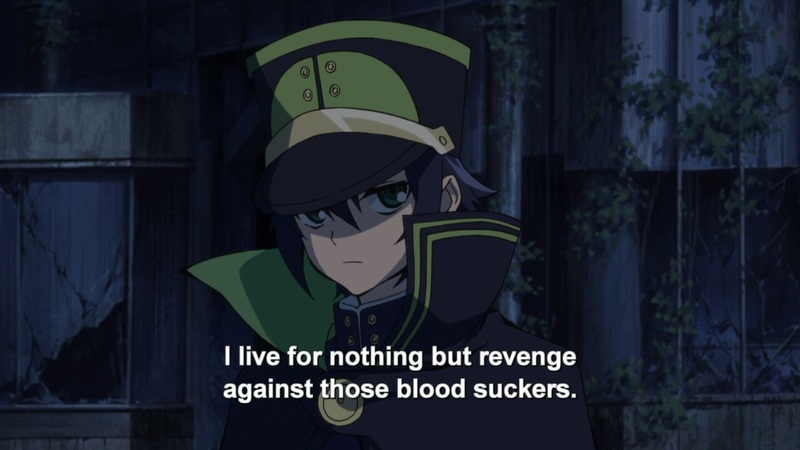 It’s clear that Universal Pictures have worked hard on bringing Seraph of the End to the UK but it has to be said some minor flaws can be spotted once you start diving in to the disc content and it mostly revolves around subtitles. For an unclear reason Universal Pictures have opted to place only the full dialogue subtitle options on the subtitle menu. The issue here is that in order to change the text/signs translation subtitle track it has to be done during an episode itself rather than through the main menu; ideally it would have made more sense to seperate the subtitle options into ‘Full Dialogue’ and ‘Signs/Text’ on the main menu so that it could allow people to choose their preferred subtitle format. Realistic it is a relatively small flaw, as you would only notice if you decided to change audio and subtitle options; but as it exists it is something thats worth mentioning. 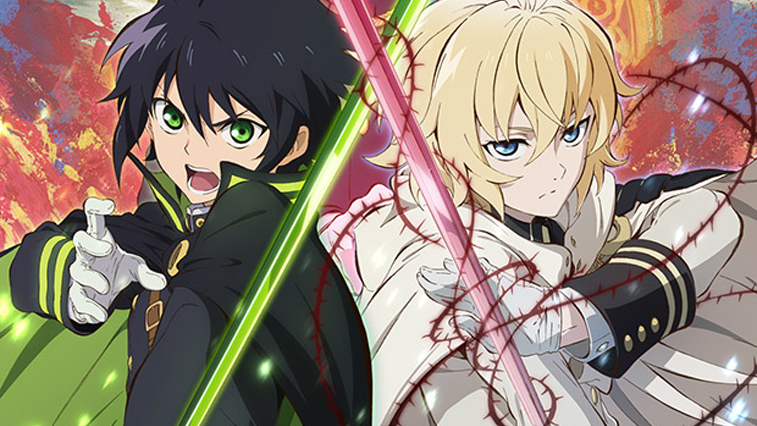 On the whole though this Blu-ray release of Seraph of the End – Season 1 Part 1 has been given a nice UK / European release so it will be interesting to see how future anime releases, such as The Heroic Legend of Arslan, will be handled.